Olivine magnesia olivine combined with particularly strong anti erosion performance, by improving the Magnesia Brick combination of forsterite content phase can improve the corrosion resistance of Magnesia Brick. Therefore, adding 20% in Magnesia Brick ingredients of forsterite powder, can form protective magnesia particles and to reduce the forsterite erosion combined with matrix. The brick prices were relatively cheap, has a large number of overseas for glass kiln heat storage central regenerator. barium feldspar forsterite bricks whereas olivine erosion resistance performance is good, and the thermal shock resistance of deficiencies in its binding phase, the introduction of barium feldspar can improve the thermal shock resistance of the brick. Celsian is in the firing process of the formation of the matrix phase, and only in combination. Barium feldspar content is 15%, the best performance of silicon, using temperature of about 1250 DEG c.. Research shows that, the erosion of barium feldspar can resist alkali and sulfate. Application of non shaped refractories unshaped refractory in glass kiln is a kind of development trend. The British adopted refractory precast concrete block masonry regenerative chamber, checker brick bottom arch, flue, a small furnace plate, burner, greatly reducing the furnace structure joints, improve the furnace construction speed and shorten the cold repair time, France SEPR ERSOL is taking ER1681 fused particles as the main component made of unshaped refractory material series, and supporting the use of electric melting brick at the bottom of the pool, the excellent anti erosion of glass, and the precipitation of bubbles and stone formation tendency is weak. Some Japanese glass kiln pool bottom has all use ER2SOL series of amorphous material. Foreign glass kiln for theoretical study of refractory material around how to further improve the anti erosion of glass and improve mechanics performance aspects, in order to further prolong the furnace life. Glass furnace insulation materials abroad widely used high aluminum brick insulation glass kiln 7, light brick and fiber, mainly in aluminum silicate fiber based materials. In Germany, in addition to the use of diatomite, aluminum silicate and silicate fiber materials, the extensive use of lightweight products with calcium silicate based, in addition to Didier company and the glass industry closely follow the development of a composite plate, which is composed of two kinds of material, called “SSH” (Shood Supral H). The first layer thickness of 50~75mm composite plate, is made of clay refractory material is quite dense, second layer thickness of 100~125mm, is the use of ultra lightweight refractory (refractory clay or to calcium silicate based material is made of). The total thickness of the 150~200mm composite board, its size is consistent with the brick surface size is insulation. CIS multi use lightweight phosphate concrete, fiber and filler. Lightweight refractory particulate filler binder is used aluminum chromium phosphate binder, the binder acid ratio is 2.3, the density of particles is between 1.55~1.6g/cm3, industrial Al2O3, artificial Al2O3, use temperature of 1800 DEG C. Light phosphate concrete is a new type of lightweight heat-resistant concrete with phosphate as binders and porous clay broken material made of lightweight concrete, the main performance parameters of the optimal composition of phosphate for 800~1100kg/m3: density, compression strength is in the range of 7~12MPa 0.3~ 0.35W /cm.k, thermal conductivity, long-term use temperature is 1270 DEG c.. The evaluation technology for glass kiln refractories 1 continuous bubble experiment continuous bubble experiment method is actually occurring directly observed under high temperature bubble, through the high temperature aging changes recorded TV image, can long time, observe the occurrence status of refractory bubbles continuously, can be evaluated more close to the actual kiln. Due to the determination of aging changes, so it can be determined as follows formula refractory bubble generating speed. This is shown the number of bubbles unit occurred from the refractory material per unit area, can carry out the more accuracy evaluation. Erosion test method of molten glass corrosion resistance of refractories, test method and testing method of dynamic static erosion erosion. The former general test method using rotary erosion, the latter generally use finger test method and clamp eddy test method etc.. However, these methods for all of the refractory and glass, are not able to correctly showed good reproducibility of its corrosion resistance, and hope to have good erosion test methods of reproduction, so that corrosion resistance of refractories for glass melting liquid. Volatile test from NOX and ideas for energy saving to reduce the starting, striking oxygen combustion technology. When viewed from the combustion air to the oxygen combustion, the combustion exhaust gas amount is reduced to about 1/5, so the upper space of glass furnace of R2O, B2O3, PbO, SiO and other volatile constituent concentrations increased by a large margin, water vapour partial pressure. The increase of these volatiles increased concentration and water vapor partial pressure, such as the Na2O as the NaOH takes effect, it will tend to further increase the erosion force, accelerate the upper part space of the refractory erosion, influence the service life of the kiln. 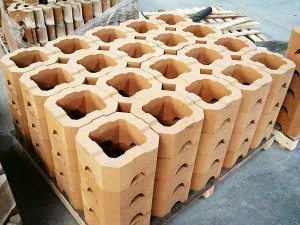 Therefore, in the use of oxygen combustion, evaluation and selection for the test of refractory materials of the upper space is very important. Production technology development trend of refractory material 1 is more widely used synthetic materials and selection of mineral used as refractory materials, improving the purity of raw materials and compactness, usage will be estimated such raw materials reached about 30%.
. in the process, to further strengthen the influence of raw materials and semi-finished products of physical and chemical, fine grinding, such as height using superfine powder mill batching equipment homogenization, using fused material to strengthen the components interact, using high pressure forming and according to the structure and properties of the refractory material sintering temperature raised. Widely used in composite materials, strengthen the grain boundary tissue refractory material structure, development of high performance ceramics direction. Through the low temperature treatment and a variety of different binders (ceramic suspended and colloidal solution, tar, etc.) the development of energy saving of unfired and unshaped refractory. Study and make full use of the chemical properties and carbon to the interactions between the various additive effect on refractory properties and other components and. Development of refractories for glass kiln in China, will continue to revolve around the glass furnace life, glass product quality and cost, energy consumption and environmental protection and other aspects, that is to say, the main problem of glass kiln refractory is facing the development of low temperature molten aspects. Along with the popularization and application of oxygen enriched combustion glass melting furnace, oxy fuel combustion and non arsenic material melting process and electric boosting technology, will be on the refractory material especially casting refractory material put forward higher requirements. With the requirements of the scientific development of refractory materials with higher performance, which also developed more new refractory materials, and the corresponding evaluation technology. In short, maximum limit satisfies the production needs of people.